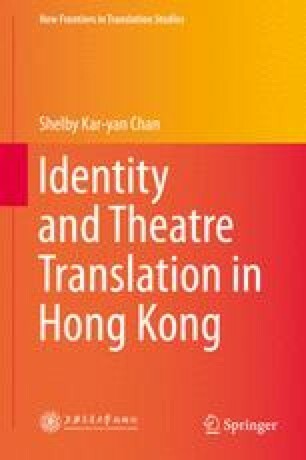 Identity mobility has been a popular theme in the translated theatre of Hong Kong since the 1980s. In addition to Twelfth Night, which we have discussed in Chap. 6, titles such as A Servant of Two Masters, The Importance of Being Earnest, Noises Off, Spring Fever Hotel, A Midsummer Night’s Dream, Run for Your Wife, A Flea in Her Ear, Room Service, An Absolute Turkey and Whose Wife Is It Anyway? were frequently staged and widely loved by the local audience. Among these plays, two titles particularly caught the imagination of the Hong Kong audience, namely, Ray Cooney and John Chapman’s Move Over, Mrs. Markham! and George Bernard Shaw’s Pygmalion. All quotations from Move Over, Mrs. Markham! come from Ray Cooney and John Chapman’s Move Over, Mrs. Markham! (London: Warner Chappell Plays Ltd, 1995). All quotations from Szeto Wai-kin’s Naughty Couple come from a photocopy of the 1993 handwritten performance script (unpublished). All quotations from Szeto Wai-kin’s Naughty Couple come from a scanned copy of the 1993 typewritten performance script (unpublished). All quotations from Pygmalion come from George Bernard Shaw’s Pygmalion and Three Other Plays (New York: Barnes and Noble, 2004). All quotations from Rupert Chan’s Lovely Is This Noble Lady come from a photocopy of the 1997 handwritten performance script (unpublished). This writer owes her gratitude to Mr. Szeto, Mr. Chan and Mr. Dominic Cheung for providing the scripts. All back-translations from Chinese to English are done by this writer, unless otherwise stated. Begelman, David. 2010. Move Over, Mrs. Markham is Frenzied Farce in Newtown. Newstimes.com. Published online 12 May 2010. http://www.newstimes.com/local/article/Move-Over-Mrs-Markham-is-frenzied-in-484617. Preview. Accessed 25 June 2010. Blunder, Andy. 2008. Commodity. Encyclopedia of Marxism. http://www.marxists.org/glossary/terms/c/o.htm#commodity. Accessed 9 May 2011. Chisholm, Kenneth. 2005. Move over Mrs. Markham. Official website of Theatre in London. Published online 24 October 2005. http://theatreinlondon.ca/2005/10/move-over/mrs-markham. Accessed 25 June 2010. HKMDB (Hong Kong Movie Data Base) 香港影庫. n.d. Naughty Couple 撞板風流 (Zhuangban fengliu). http://hkmdb.com/db/movies/view.mhtml?id=7905&display_set=big5. Accessed 11 June 2010. Lawrence, Floyd. 2010. Move Over, Mrs. Markham spreads the Marmalade thick. Theatre previews, reviews, GoErie.com. Published online 20 May 2010. http://www.goerie.com/apps/pbcs.dll/article?AID=/20100520/ENTERTAINMENT0201/305199889. Accessed 9 May 2011. Robyns, Clem. 1994. Translation and discursive identity. Poetics Today 15(3): 405–428. http://www.jstor.org/stable/1773316. Accessed 26 April 2011. Yun, Josephine. 2003. Move over, Mrs. Markham. Theater, Arts Section, Baltimore City Paper, 9 October 2003. http://www.citypaper.com/arts/story.asp?id=4217. Accessed 9 May 2011.